As I mentioned via Facebook a few days ago, VV is turning 3 this month (!!) so I’ve celebrated with doing a huge site makeover. It started out as an idea to maybe get a logo designed and ended 2 weeks later with a whole new layout, color scheme, and aesthetic. I’ve been tackling it all myself which means I change my mind about things every 5 minutes so don’t be surprised if you continue to see some tweaking (TWEAKING. Not twerking – I don’t participate in that cultural dance move, sorry guys) happening around here for the next few weeks. I’ll probably be posting even more pictures than I already do (like the ones above -what do they have to do with this post? 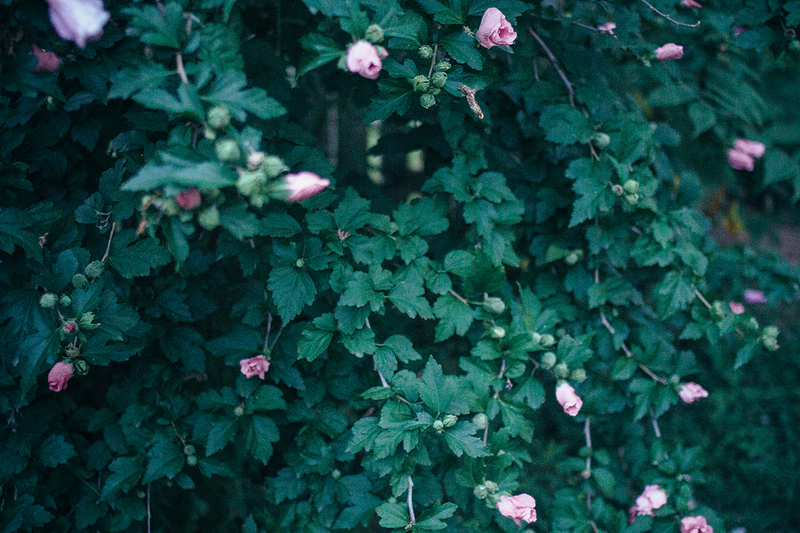 Nothing really – I just like hanging out in my backyard shooting with my DSLR and film) since all the photos are now HUGE (YAY!). 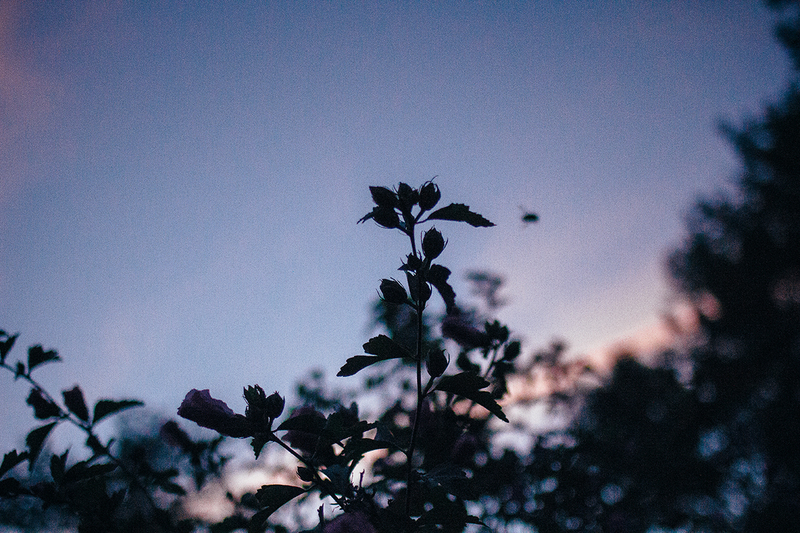 Anyhow, this post isn’t about site re-designs or gardens so let’s get to the point. 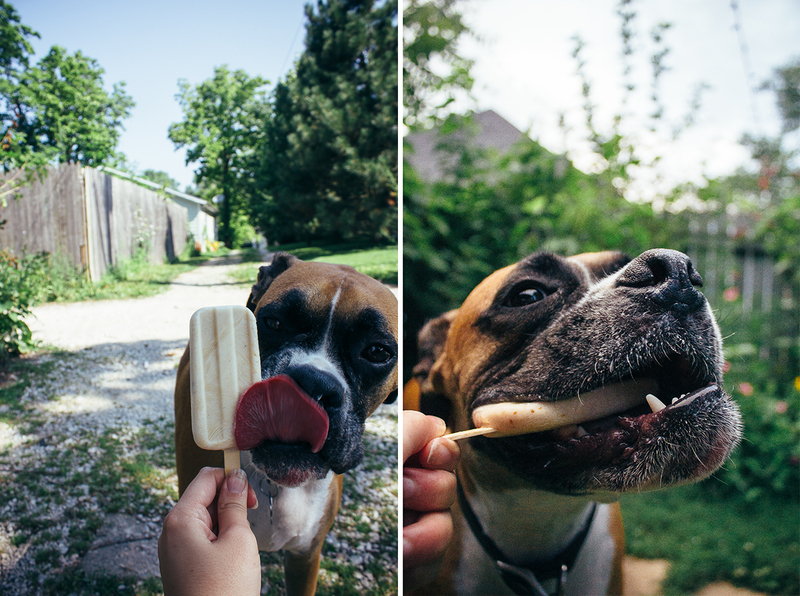 This post is actually about having a ridiculously spoiled dog that enjoys all of his treats homemade and gets half the popsicle mold reserved for him in the summer. Meet Tuko (pictured above. 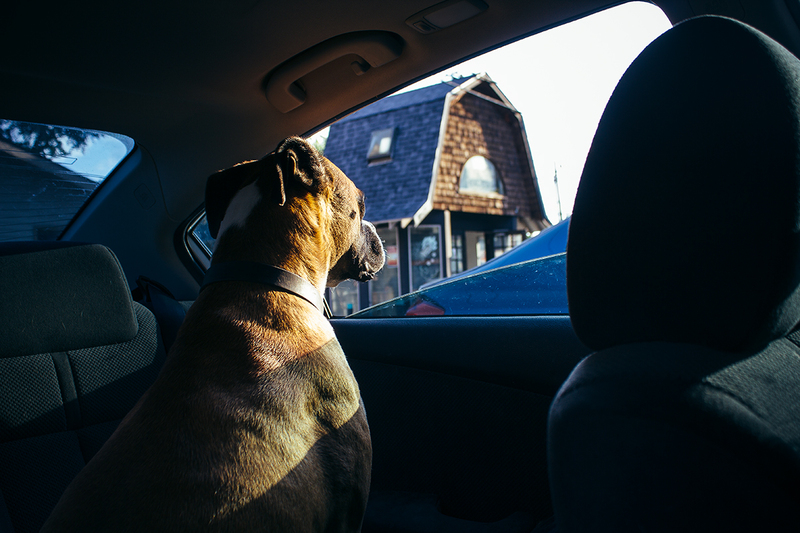 He only looks at the camera to scowl at it…) – he is a 2 year old boxer that we treat more like our own kid than a family pet. You may have already met him here or here or here but I don’t hold you accountable for remembering since those posts were so long ago and you haven’t seen him in awhile. When he is not sleeping on the couch or bed, he enjoys hanging out in his “room” (AKA our backyard – pictures above), racing Wyatt on his skateboard, and whining while looking longly at his leash. 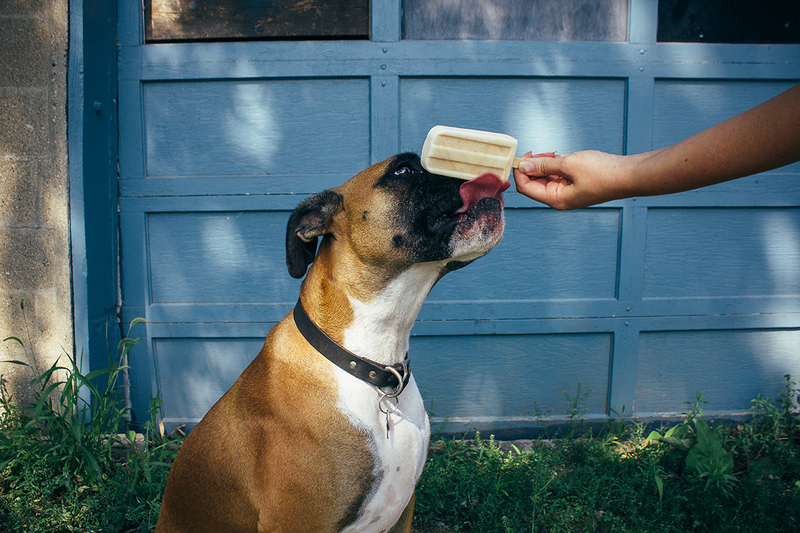 Boxers are known for having trouble with extreme weather – their hair is too short to keep them warm in the winter and their short snouts are a handicap for them in the summer when the only way to stay cool is to pant it out. A simple solution could be just to keep them inside during the summer or make sure that they have ice water provided for them at all times. 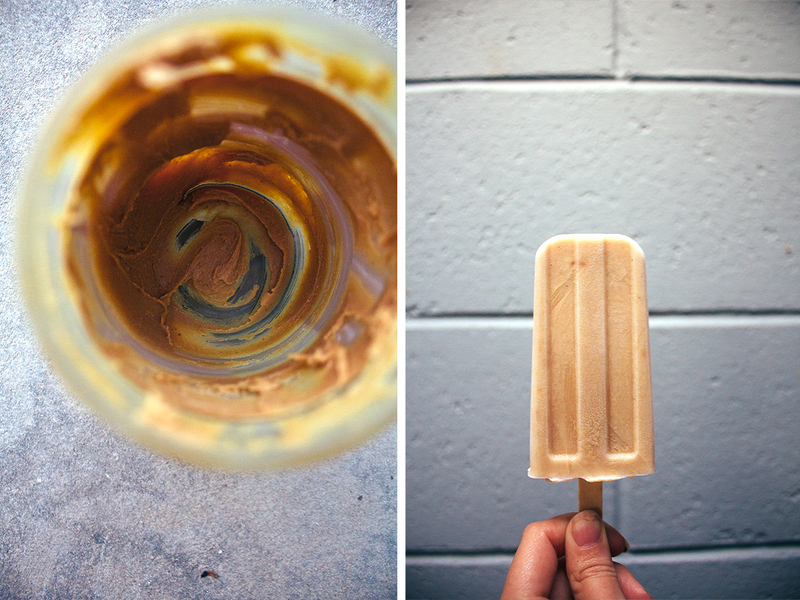 I tend to like to take the fun route though and keep a stack of these peanut butter popsicles (also known as ‘pupsicles’) in the fridge at all times for Tuko to enjoy after a long day at the lake or after our afternoon walk. 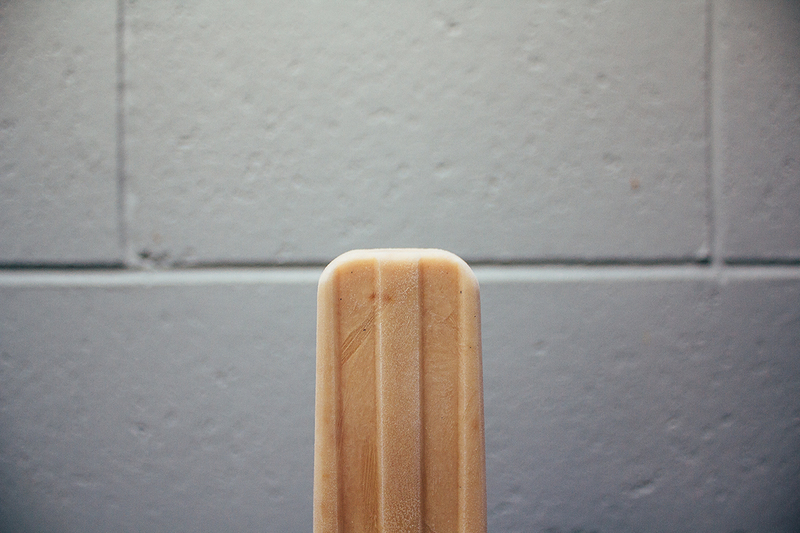 These popsicles are about as simple as it gets and you could make them in anything you’d like. I made the first batch (the ones pictured in this post) with my popsicle mold which makes them super cute but there are 2 things I’d like to note if you go that route 1. they are pretty large so I would only recommend making them this size if you have a large dog and 2. you’ll want to stay with your pup the whole time they enjoy it (and preferably hold it them for) to make sure they don’t eat the stick (that could end up very bad). For the second batch, I froze them in ice cube trays and they were the perfect size (plus so easy to just throw in his dog dish to let him enjoy when he wanted) so it’d highly recommend going that route when making these. This recipe only involves two ingredients – peanut butter and yogurt. You are more than welcome to add in other ingredients (canned pumpkin, sweet potatoes, oats) but do make sure your dog reacts well to these ingredients first since all dogs are made different and have different dietary restrictions. You’ll also want to make sure to use only plain yogurt (NO flavoring) and organic peanut butter to keep it as natural as possible. Lastly, I watered these down quite a bit since it is a summer treat and I want to make sure Tuko is staying hydrated – feel free to add more or less water depending on how you’d like the consistency of these to turn out. Other than all those suggestions – enjoy! Your dog is going to love them! Tuko doesn’t like the camera (see photo below) but he sure did love these treats (see other photos below). 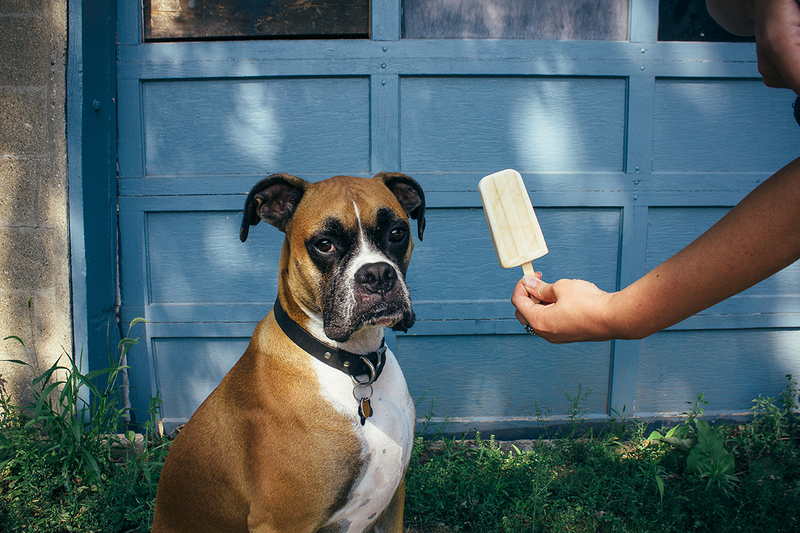 Perfect popsicle for your pup! Slowly add in the water as you whisk until everything is incorporated. Divide evenly between your ice cube tray or popsicle mold. Stick in the freezer until frozen. What a fantastic idea!! I actually bet I would love them too haha! DUDE. I am definitely making these! It’s the HUGE pictures, I cannot resist! LOVE these photos and yes, I am so making these! your site redesign looks SIIIIIIICK! And damn it’s fast. p.s. 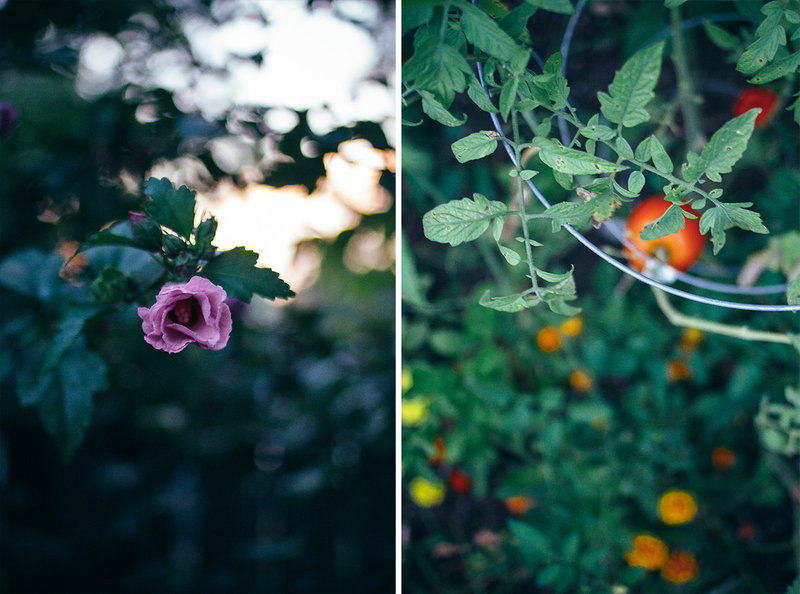 our backyards look THE SAME. Awesome redesign! Beautiful pup! Tasty pops! Congrats on 3 years! You’re brilliant and only getting brighter! WHAT a cute boxer he is!! I just love that face! Our dog would gobble these treats, he is a peanut butter lover to the max. Yay! Oh my goodness, Shelly, the new design is ahhhmazing. I love it! I mean, it was rockin’ before. Simplicity is a winner in my book, though oftentimes I have trouble following even my own preferences. Tuko’s photos are straight-up hilarious! I love it!! What a pampered pet! 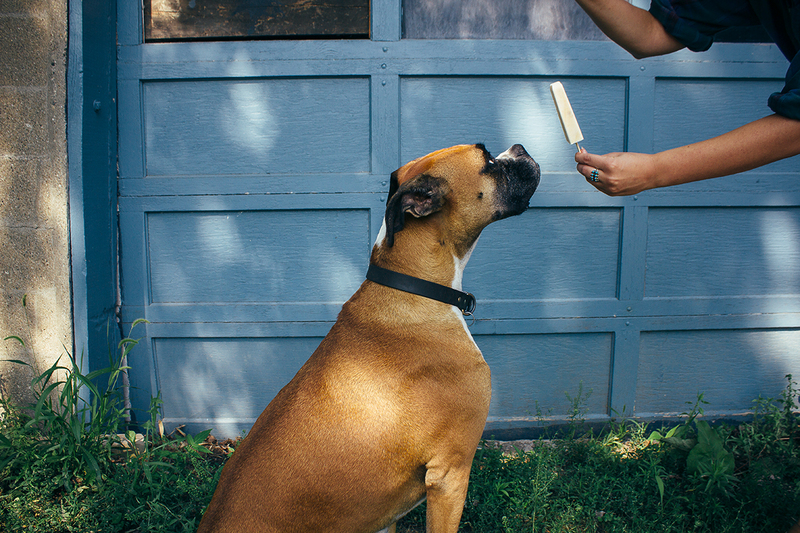 Love the idea of peanut butter anything, and my dog thinks so too. Congrats on the three years, keep up the great work!! Hmm unusual, sounds good 🙂 Such a cute doggy 🙂 Love the pics! Oh, my. This post is just too cute. I am going to have to make these for my dog immediately. Love, love the new site design! So gorgeous and your pup! I think mine definitely would go for some of these! Great idea.. I also have a boxer she is only one year old… It amazes me how we love her to the extent of letting her get away with everything… Trust me the spiking it’s a group effort!!! Again thanks for the recepie.. Athena loves peanut butter and the Pupsicles will be a good toy substitute .. At least until she devours it..
Just wanted to say I love your dog! I used to have a boxer and he was the best thing that ever happened to me and I don’t think I can ever bear to have another boxer, but I just love them so much! Oh, and the Popsicles are pretty nifty, too!